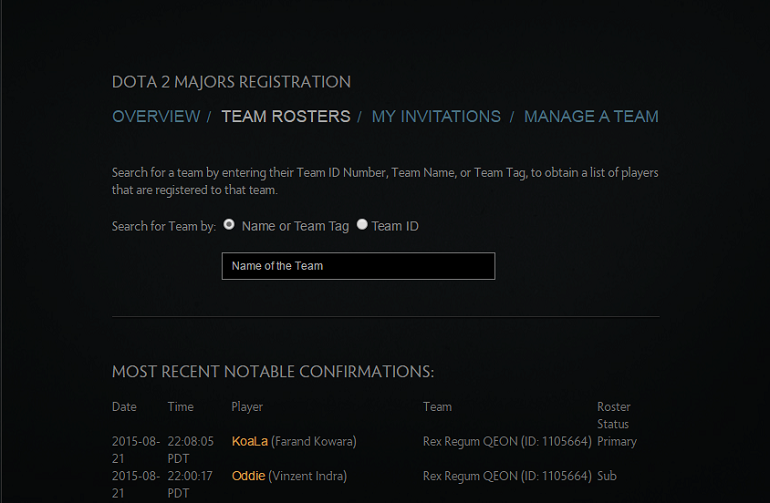 The Manila Major team registration has been announced by Valve. 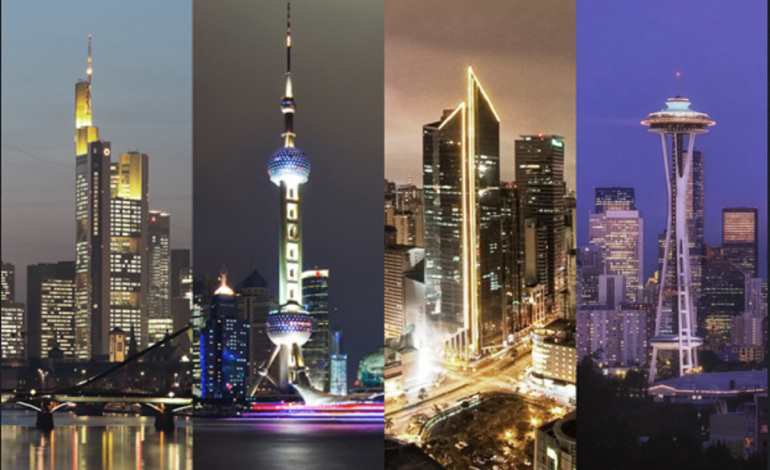 Registration for the Spring Major season began on March 7th, shortly after the conclusion of The Shanghai Major. The registration will be open until March 27th, before the rosters are locked for the Spring Major. The roster lock will be in place until the end of The International 6. The Shanghai Major has just ended and Valve has already announced the dates for the Manila Major team registration period. Teams have 21 days to register, between March 7th – March 27th. The roster lock will stay in effect until after The International 6. This means that teams that lock their rosters for the Manila Major will be bound to keep their lineups intact through The International 6, scheduled to take place in August, if they aim to be directly invited or receive a regional qualifier invite. In order to be considered for an invitation, all teams must first register at the website. Teams will have the option to register both active members and substitutes. All teams will need to sign up in order to be eligible for an invitation. 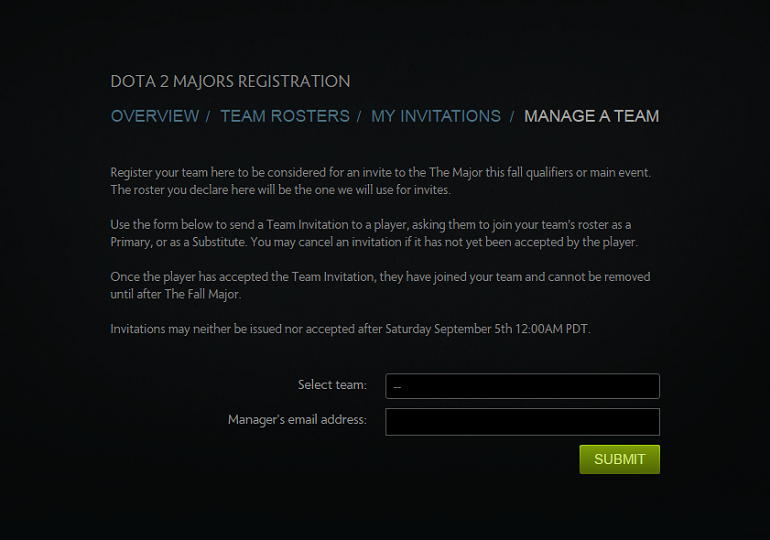 The roster that is registered through this process is the one that will be considered official by Valve. 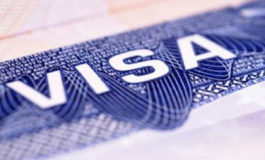 The registration form will allow the manager to invite the team members and manage the team roster. Players will be able to accept, decline and view their invitations to teams as either a primary member or substitute. Once players have accepted the invitation to join a team, they become part of the official roster, and changes cannot be made until after the International 6. Invitations may neither be issued nor accepted after March 27th, 12:00AM PDT. Players and fans are able to search for a specific team and have access to a list of all the registered players. All rosters are made public as soon as a player accepts the invitation. Valve has provided answers to some of the most commonly asked questions regarding the roster lock, roster invitations and registration for the Manila Major. Yes, everyone needs to go through the registration process again. Each trade window sets a clean slate and all teams need to confirm their players again. That way, players can opt to lock to different teams and teams can opt to lock new players. HOW DOES A PLAYER BECOME LOCKED TO A TEAM? 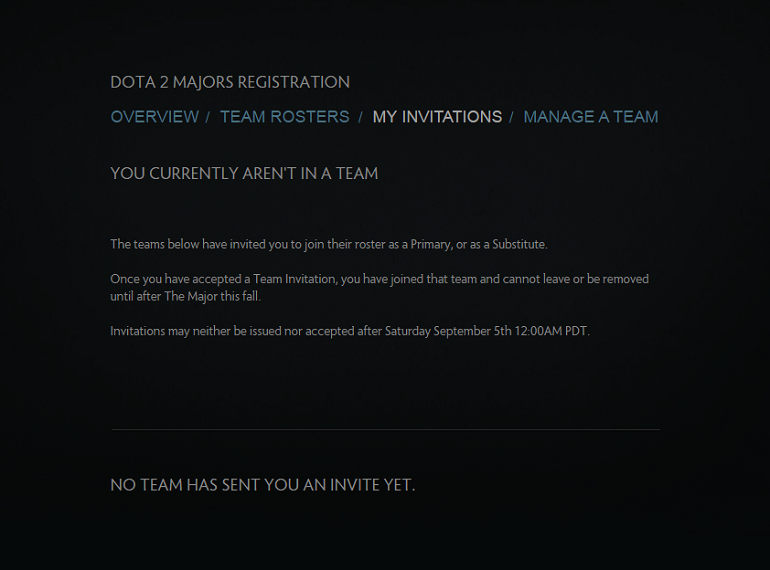 First, the administrator of a team issues either Primary Member invites or Substitute invites to players. Then these players can review their invites and choose to accept one of them. Once they’ve done so, the player is a confirmed member of the Pro Team and is locked until the next trade period. CAN A PLAYER BE INVITED TO MORE THAN ONE PRO TEAM? Yes, but they may only accept one of those invites. Rosters will be locked on March 27th, 2016, at 12:00AM PDT, and will remain locked until after The International. WHAT HAPPENS TO PENDING INVITES AFTER March 27th ? CAN TEAMS GOING THROUGH OPEN QUALIFIERS HAVE SUBSTITUTES? Everything you need to know about the Manila Major.